Doggy Noses & Yoga Poses - Love City Barks, Bends, and Beer! The pups are headed to Philadelphia, and redefining what a "growler" is! Join us as we present Doggy Noses & Yoga Poses at Love City Brewing Company to benefit It's A Ruff Life Rescue! You do the yoga while the pups do the cuddles! 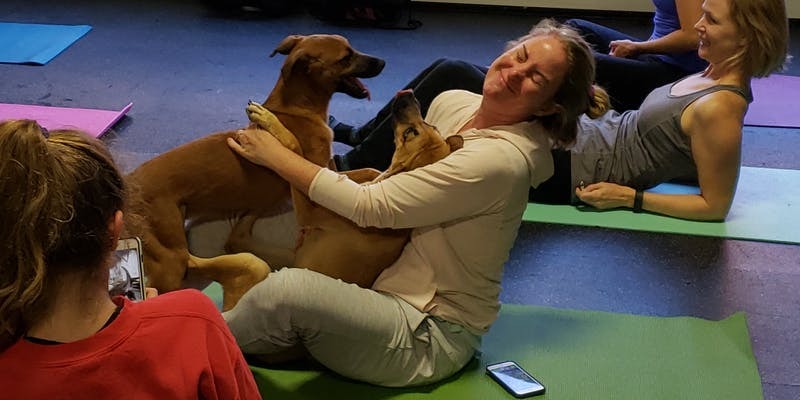 Adorable ADOPTABLE puppies and dogs will be allowed to ROAM FREELY and interact with you during this one-hour mixed level yoga class featuring Roots Philly Yoga owners/instructors Lauren and Erik Burling, so be prepared to get puppy kisses! Pawssport holders will also be entitled to a complimentary pint after the class (for guests 21 and over). Space is limited and interest is high, so order your Pawssport today! Tickets are $35 if purchased online, and $40 if purchased at the door (space permitting). A portion of all ticket sales will be donated to It's A Ruff Life Rescue. Please bring your own yoga mat or towel to this class, and let's have some fun! NamaStay! By purchasing this ticket, I confirm the following: I understand as is the case with any physical activity, the risk of injury, even serious or disabling, is always present and cannot be eliminated. If I experience any pain or discomfort, I will listen to my body, adjust the postures and ask for support from the teacher(s). Yoga is not a substitute for medical attention, examination, diagnosis or treatment. Yoga is not recommended and is not safe under some medical conditions. I know that my photo may be taken for promotional purposes. I affirm that I alone am responsible to decide whether to practice yoga. I understand as is the case with any interaction with dogs, the risk of injury, even serious or disabling, is always present and cannot be eliminated. I hereby agree to irrevocably release and waive any claims that I have now or hereafter may have against Doggy Noses & Yoga Poses, Lauren Burling, Erik Burling, Roots Philly Yoga, It's A Ruff Life Rescue, and/or Love City Brewing Company. Check Presentation at the Rail Park!